Graphene electrodes could enable higher quality imaging of brain cell activity thanks to new research by a team of engineers and neuroscientists at the University of California San Diego. Over the past five years, researchers have been exploring graphene electrodes for use in neural implants that can be placed directly on the surface of the brain to record neuronal activity. They have several advantages over the traditional metal electrodes used in today's neural implants. They are thinner and flexible, so they can conform better to brain tissue. They are also transparent, which makes it possible to both record and see the activity of neurons directly beneath the electrodes that would otherwise be blocked by opaque metal materials. However, graphene electrodes suffer from high impedance, which means electrical current has difficulty flowing through the material. This hinders communication between the brain and recording devices. Readings are noisy as a result. And while there are various techniques to reduce the impedance of graphene, they ruin the material's transparency. In a new study, an interdisciplinary team of researchers at UC San Diego has developed a technique to engineer graphene electrodes that are both transparent and 100 times lower in impedance. Duygu Kuzum, a professor of electrical and computer engineering at the UC San Diego Jacobs School of Engineering, led the work. Her team developed the low-impedance, transparent graphene electrode arrays. They collaborated with Takaki Komiyama, a professor of neurobiology and neurosciences at the UC San Diego School of Medicine and Division of Biological Sciences, whose team performed brain imaging studies with these electrodes in transgenic mice. The work was published recently in Advanced Functional Materials. "This technique is the first to overcome graphene's electrochemical impedance problem without sacrificing its transparency," said Kuzum. "By lowering impedance, we can shrink electrode dimensions down to single cell size and record neural activity with single cell resolution." Another important aspect of this work is that it is the first to uncover the root of graphene's high impedance—a fundamental property called quantum capacitance. It is essentially a limit on how many "open seats" graphene has to store electrons. And with a limited number of seats dispersed throughout the material, electrons have fewer paths to travel through. Finding a workaround to this limit was key to lowering impedance. Kuzum's team found that by depositing platinum nanoparticles onto graphene's surface, they created an alternate set of paths to channel electron flow. "We chose platinum because it is a well-established electrode material. It has been used for decades due its low impedance and biocompatibility. And it can be easily deposited onto graphene at low cost," said first author Yichen Lu, an electrical engineering Ph.D. student in Kuzum's lab at UC San Diego. Kuzum's team collaborated with neuroscientists in Komiyama's lab to test their electrodes in transgenic mice. 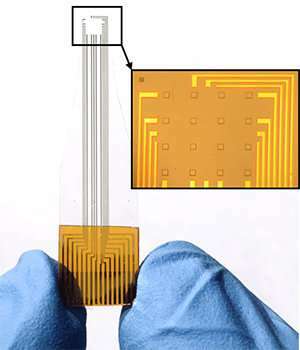 Researchers placed an electrode array on the surface of the cortex. 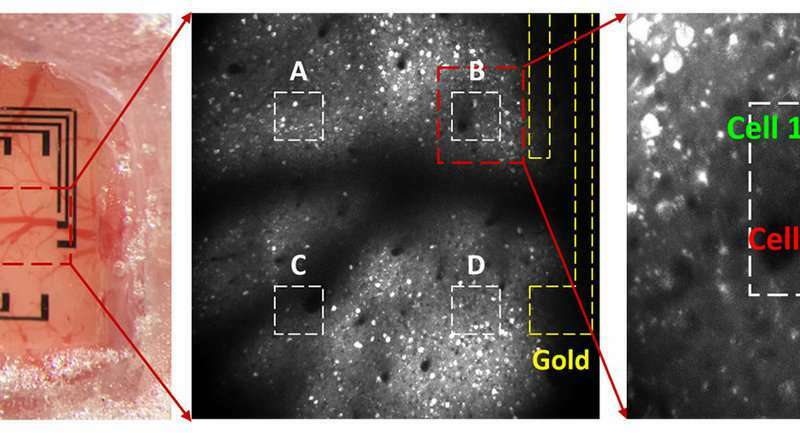 They were able to simultaneously record and image calcium ion activity in the brain. "This new technology makes it possible to combine macroscale recordings of brain activity, like EEG, with microscopic cellular imaging techniques that can resolve detailed activity of individual brain cells," said Komiyama. "This work opens up new opportunities to use optical imaging to detect which neurons are the source of the activity that we are measuring. This has not been possible with previous electrodes. Now we have a new technology that enables us to record and image the brain in ways we could not before," said Kuzum. The team's next steps include making the electrodes smaller and incorporating them into high density electrode arrays. Gee Try copper and they will be even better conductors.